We’d love your help. Let us know what’s wrong with this preview of Where, Oh Where, is Kipper's Bear? by Mick Inkpen. Help Kipper search for his lost teddy bear. Could he be hiding in the tree? Under the stairs? Peek into holes, pull the tabs, and see who pops out.Join everyone's favorite character in a lively rhyming story that bursts from the page. This is a classic pop-up book you'll read again and again! 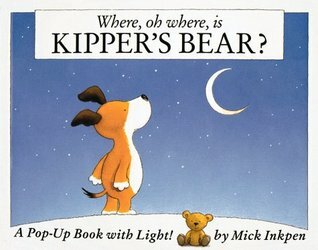 To ask other readers questions about Where, Oh Where, is Kipper's Bear?, please sign up. 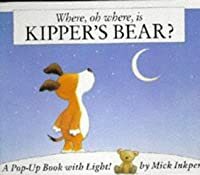 Be the first to ask a question about Where, Oh Where, is Kipper's Bear? I like this book because it is really enjoyable and entertaining especially for younger children. I feel like this book describes a child because when a younger child looses their favorite you, they will look for it and won't give up until they find it. I like how this book is also pop up because children love those type of books and also the different type of settings it has. I think a child will like this book because of the pop ups and it shows lots of animals. I also like that this book take I like this book because it is really enjoyable and entertaining especially for younger children. I feel like this book describes a child because when a younger child looses their favorite you, they will look for it and won't give up until they find it. I like how this book is also pop up because children love those type of books and also the different type of settings it has. This is my all time favorite book I read as I was growing up, it is an awesome rhyming story that your children will never want to put down! Little kids love it because it is very interactive with the way the pictures are able to pop up and become 3D. Kids think it's fascinating and it also is a good story to tell. I highly recommend it for children ages 2 to 5 years. The poetry in this book gives the story more rhythm when reading to others. Also the flaps and openings in the pages keep children switched on and eye contact is fixed on the pictures. The last page also included a light feature which seems so lovely especially maybe when it is bed time reading and dark, so the child can really be involved with the story. Cute lift the flap book. Some of this book has gotten broken because it is a library book. This is one of my favourite children's books. He began his career as a graphic designer, and worked with another children’s author Nick Butterworth (of Percy Mick Inkpen is one of the most popular author/illustrators in the world. His books have sold over 4 million copies, and have been translated into over twenty different languages. His best-loved characters are probably Kipper and Wibbly Pig – who are both stars of their very own TV series!